Although Fade (25'11") is not what is nowadays considered to be a full-length CD, the listener will never even know. Once fully inside this piece, time becomes a malleable dimension, expanding, contracting, even stopping as the work trails off into silence on four occasions. 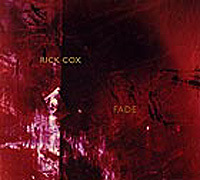 It is difficult to keep track of the neo-classical, quasi-new age, post-ambient, chamber music of Rick Cox. The edge of this work is in constant negotiation as the ensemble (which, with Cox on guitar, includes Thomas Newman on piano and Peter Freeman on bass) moves in a consonant harmonic motion held back by a breathing atonal atmosphere. The musicians may be feeling their way through this work of amorphous, sonic minimalism, but with the ringing tone of a well-placed piano chord or the grounding rumble of the perfect bass note, the gradient quality of Fade's sound and mood is brought into sharp focus. A process of intuition, Cox's work is nuanced, peculiar, and with a well-balanced amount of warmth and negative space. His is an innovative music for the heart by way of the mind.